What questions should I ask when deciding on a childcare provider? What does it mean to be a “Christian Academy”? What ages does NACA serve? How long has NACA been open? What are the qualifications of the NACA staff and faculty? Where can I find out more about the A Beka Book curriculum? How does NACA handle food allergies? What does a typical day at NACA look like? 1. What questions should I ask when deciding on a childcare provider? How much experience do the owners and operators have in business? Is there time set aside for the parent and teachers to discuss the child? Does the school have an outdoor space and how often is it used? What is the policy for taking care of sick or injured children? Then ask yourself these four questions. Visit the preschool, rely on what you see. Are the children safe, busy and happy? Do the teachers seem to like what they are doing? 2. What does it mean to be a ‘Christian Academy’? 3. What are NACA’s hours? NACA is open to serve our families from 6:00 am until 7:00 pm. 4. What ages does NACA serve? 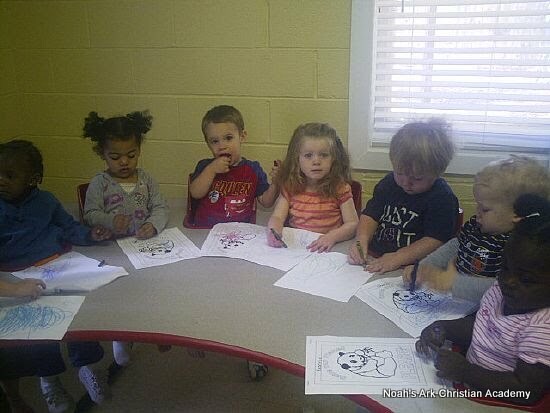 Children must be at least two-years-old and walking to enroll at Noah’s Ark Christian Academy. We offer Pre-School, Pre-K, and Georgia Pre-K classrooms. NACA also offers before and after-school care to older school-aged children. During scheduled Paulding County School breaks (fall, summer, winter, spring), we offer camps for school aged children. 5. How long has NACA been open? Noah’s Ark Christian Academy has proudly been serving the families of the greater Hiram area since 2008. 6. What security measures are in place to protect my child? We take the safety of our children very seriously. Please see our page on school security for details. 7. What are the qualifications of the NACA staff and faculty? Read all about our staff and faculty on our faculty page. 8. Where can I find out more about the ABeka Book curriculum? The ABeka Book curriculum is a Christian curriculum with over 50 years of development and refinement. Lessons are designed to be lively, interesting, and memorable. Find out more about ABeka Book at http://www.abeka.com/ . 9. How does NACA handle food allergies? WE ARE A NUT FREE FACILITY – Any food items that you bring in must be store bought with an ingredient and a shelf life label-this is to avoid allergic reactions for those children afflicted with food limitations. 10. What does a typical day at NACA look like? Detailed information on each classroom’s typical schedule and special events can be found on our Curriculum & Daily Routines page.